Greater household income is not associated with greater joy, according to research. The researchers analyzed the relationship between this score and household income. They find that in every region of the world, after accounting for a person’s age, gender, and marital status, people with higher incomes are happier. But they also find that there is a level of income at which happiness no longer increases with more money. This varies by region, with Australia and New Zealand the highest and Latin America and the Caribbean the lowest. They even find some evidence that in certain places, when incomes rise above the cutoff level, life satisfaction gets lower. The chart below shows the “satiation point” for different areas of the world. The incomes are converted to US dollars and adjusted for variations in spending power across countries. These psychologists, from Purdue University and the University of Virginia, are not the first to study how income relates to life satisfaction. In 2010, the Nobel prize-winning duo of economist Angus Deaton and psychologist Daniel Kahneman, famously found that the satiation point for US households was about $75,000 (about $84,000 in 2016 dollars). This new research improves on Deaton and Kahneman’s work, because the data is able to account for the number of people in a household, has more detailed income numbers, and includes responses from many more countries. Dan Sacks is an economist at Indiana University who studies the relationship between income and subjective well-being. He tells Quartz over email that he finds the new research compelling, but far from definitive. The primary strength of this paper, Sacks says, is that the researchers have access to a huge dataset that, unlike many previous studies, includes a large number of high-income people. His main concern is that the research relies on flawed survey questions. The surveys rely on self-reported income, and previous research shows that just because people say they make a certain amount of money, it doesn't mean they actually do (pdf). “It could be true that on average, people who say they have income of $150,000 are no happier than people who say they have income of $100,000,” write Sacks. “But I’m not convinced that people who actually have income of $150,000 are no happier than people who have income of $100,000.” Also, its possible that rich people have a tendency to underemphasize their happiness compared with poorer people. People also tend to answer questions about their happiness differently on different days. While today I say my life is an eight, ask me tomorrow and it might be a seven. A person’s answer on any given day is predictive of what they say a month later, but it’s not that statistically robust. This measurement error makes it difficult for researchers to assess the income-happiness relationship with great accuracy. 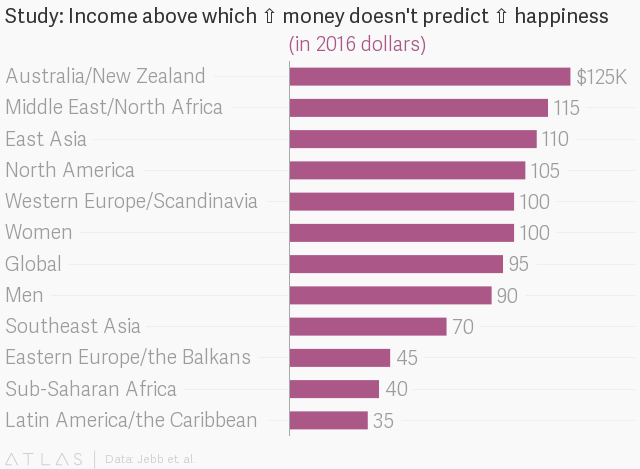 What’s the link between money and happiness? But let’s assume that the research is right, and there is some point at which higher incomes don’t predict greater happiness. Does that mean that if you already make $120,000, you wouldn’t be happier with a $30,000 raise?